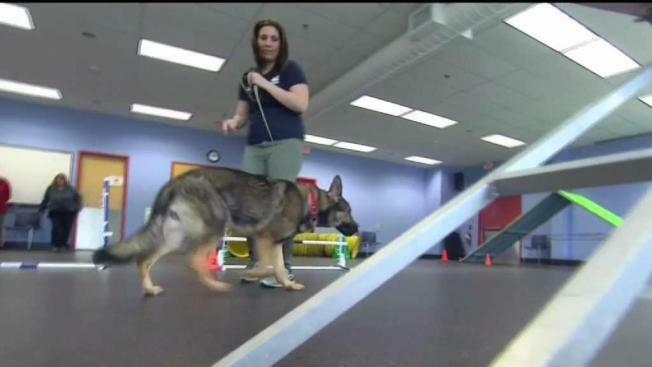 The NHSPCA has depleted most of its resources caring for 36 German Shepherds while their owner’s animal cruelty case works its way through the justice system. A group of 36 German shepherds in New Hampshire are in desperate need of the public's help this holiday season. The New Hampshire Society for the Prevention of Cruelty to Animals has depleted most of its resources caring for the animals while their owner’s animal cruelty case works its way through the justice system. The case is unprecedented for the NHSPCA. Executive Director Lisa Dennison said in her 25 years, it is the most costly and heartbreaking story she’s had to tell. Jill the German shepherd is a survivor. Her story started about a year ago when police in Bristol found her and almost two dozen other German shepherds in a barn, locked in small, metal crates, in below freezing temperatures. “Even though she’s had such a rough start in life, she still has this awesome personality,” NHSPCA staff member Emily Neily said. “These animals are growing up in a kennel and a kennel is not a home,” Dennison added. One of the dogs had puppies, leaving the shelter with 36 German shepherds. “It has now exceeded $300,000 to care for all of these dogs,” Dennison said. Still, the shelter is required by law to hold the animals until their owner’s case is closed. “This is not funded by the State of New Hampshire, it is not funded by the police departments, or the towns, the burden falls on the shelters,” she explained. It's also why the law requires cases with live evidence to be expedited. But Dennison says that isn’t happening in the case of owner Jennifer Choate. That next hearing is in January, which means instead of finding a home for the holidays, Jill will spend another Christmas in her crate and Dennison will spend the season of giving asking for donations. “Every gift, no matter how large or small makes a difference for these animals and others,” she said. Monetary donations can always be made to help the German shepherds, but the NHSPCA also needs indestructible dog toys, dog food, and treats.